After my dual cross-country on August 11, 2015, I went up a few other times to practice maneuvers and landings. One day I SO wanted to get up in the air (I know…shocking…I ALWAYS want to get up there! ), but it was pretty windy and gusty. I texted Ted, saying that maybe I shouldn’t fly? He said probably not, but did I want to practice some crosswind landings with him? Is this even a question?! I said absolutely, if he was available! Photo credit goes to Rebekah who took this picture one day when I took her up. Once he got there, we taxied out to the runway, but when we did the engine run-up and checked the magnetos, one of them was running really rough. For my non-flying friends, that is not a good thing! You have two magnetos supplying voltage to the spark plugs so that you have a back up in case one should go out during flight. So you don’t really want to start out your flight with one already running badly. So we went back to the hangar and took off the cowling and cleaned the spark plugs…and I got to help 🙂 Ted showed me out to clean out the lead build up, sandblast, wire brush, and put them back on the plane. So we got to practice crosswind landings after all! Anna wanted a flight for her birthday, so I paid Ted to give her a flight lesson (and I sat in the back of the plane, because who is going to pass up a chance to go flying?!). “But you helped her!” I protested. 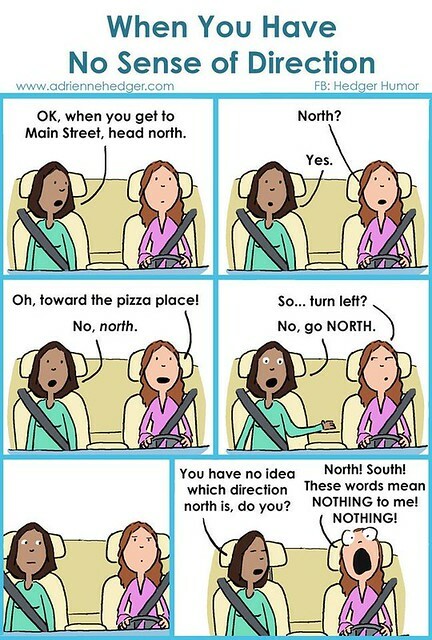 Which is so true…I get lost so easily! I can be facing east, knowing I’m facing east, but my internal compass is telling me that I’m facing west. It’s ridiculous! It’s getting a little better, and for some reason if I can visualize where Lake Michigan is, that somehow “recalibrates” my internal compass and I can get on track, lol! Also, I have since been comforted to know that I’m not the only pilot who gets lost if I don’t have a compass in front of me. One of my pilot friends shared the cartoon below and said she was the girl in the pink, and I felt so much better. Give me a compass and Lake Michigan, and I’ll be okay. 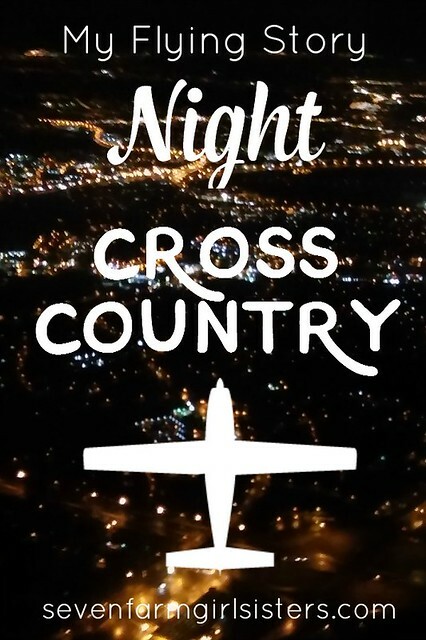 My night cross-country is probably THE highlight of my training. There’s something magical about seeing the stars twinkle over you, and the city lights sparkle beneath you…it’s just amazing! I hadn’t been up at night before this, and different members of the Mentone Flying Club told me how amazing it was and how much I would like it. Oh my goodness! It was amazing! I got to the airport around 8:15 but the sun hadn’t set yet. In order for flying at night to “count” in your logbook, you begin counting “night flight” one hour after sunset. 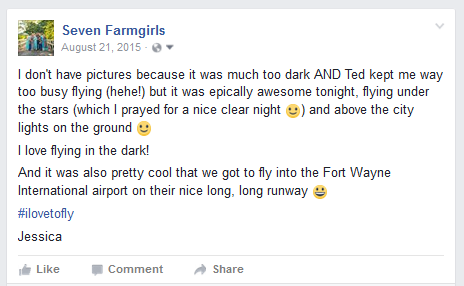 Ted teased me that I was keeping him up past his bedtime 😀 We took off at 9:35, but before that we went over my flight planning and some other flying stuff while we waited for it to get dark enough. 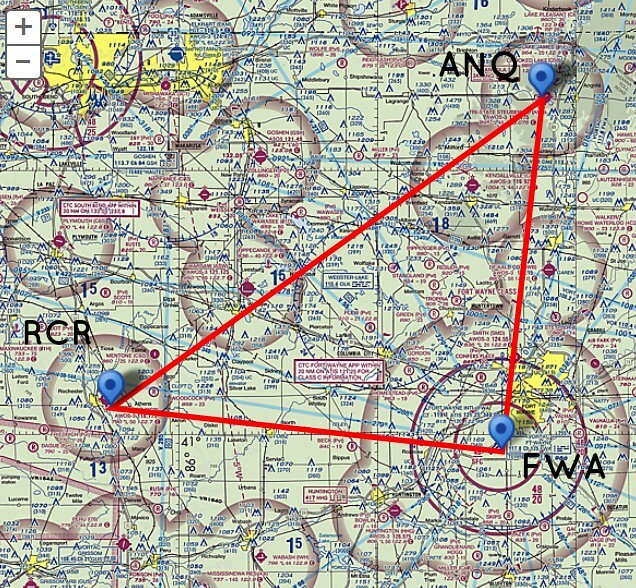 So I planned a flight to Angola (KANQ), which is 60 nautical miles from Rochester (KRCR). But instead of just coming right back to Rochester, we went to Fort Wayne (KFWA) after we landed at Angola. That was my favorite! But I’m getting ahead of myself. 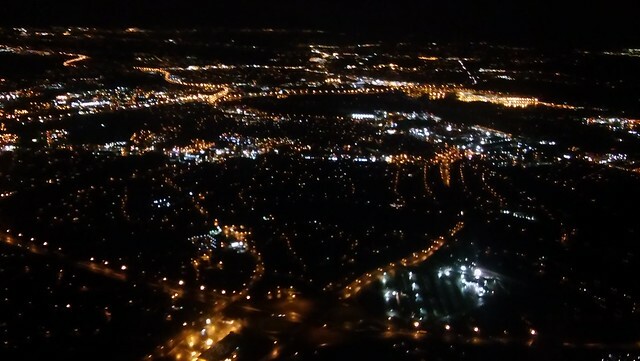 We climbed up to 5,500 feet (MSL), and I could see the lights of Fort Wayne almost immediately…it was amazing! I had asked God to give me a clear night, and He definitely did. Like I said before…the stars twinkle above you, and the city lights sparkle beneath you….oooooohhhhh! First, Ted had me practice finding my checkpoints. Finding towns is easier in the dark…they’re all lit up!!! I had picked Mentone and Warsaw as a couple of them, so after identifying them and checking with my sectional (map), Ted had me put on “the hood”. This might be like the Cone of Shame in aviation…it’s not all that fun to wear 😀 And the one that our club has is very old and uncomfortable. Trying to put a headset over the hood kept the seals around my ears from blocking all of the noise out, so it was loud, and then the hood kept sliding down too far, lol! It was an experience! The purpose of the hood is so that you can’t see out the windows, and then you’re forced to only focus on the instruments. 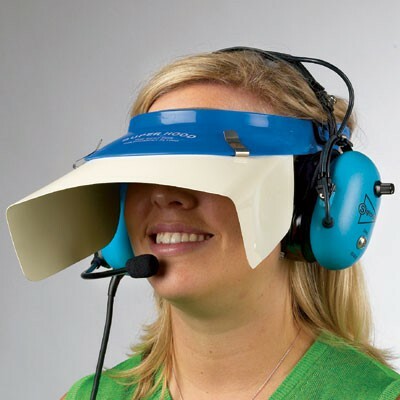 This simulates flying in a cloud, or any time visibility is bad. As a Private pilot, you aren’t allowed to purposely fly into these conditions, but they want to you to have at least some instrument training in case you would find yourself in that situation. 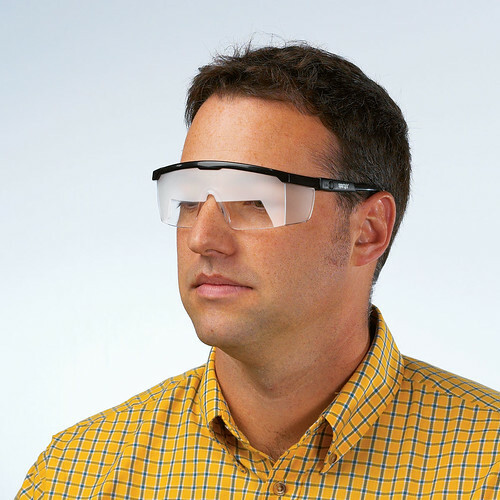 There’s a better option, called “foggles”. They do the same thing, only they’re more like wearing safety glasses that have had the top half of the lenses “fogged out”. It’s a lot easier to wear underneath a headset. However, at the time the hood was all we had. Later on someone donated some foggles to the club. (Thank you!!!). So I flew for what seemed like a very long time “under the hood”. Ted hold me what altitude and heading to hold, and I had to keep checking to make sure that the gyro compass was lining up with the magnetic compass. 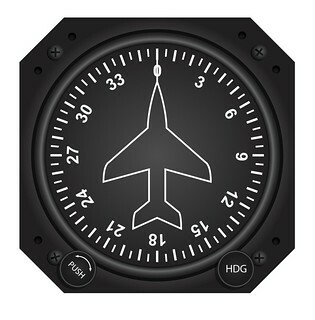 Gyro compasses like to precess and can start to show the wrong heading, so you have to realign the gyro compass to match the magnetic compass. Sometime while flying the airplane, listening to (and trying to understand) the chatter on the radio, and having this hood on my head. I suddenly felt overwhelmed. I felt overwhelmed a lot during my training, but never so much that I wasn’t still having fun. 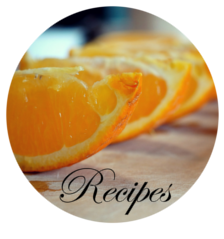 It was the kind that was challenging and enjoyable. I always reminded myself to only focus on what Ted was giving me at the moment. 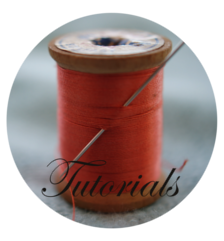 If I started thinking about all that I still needed to learn, it was too much. 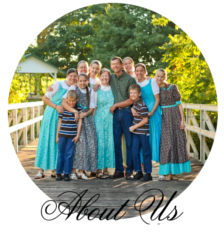 But for the first time, I felt discouraged and overly overwhelmed. I suddenly realized where this was coming from. This was not the regular overwhelm I was used to feeling. This was discouraging-beat-you-down-you’ll-never-make-it kind of overwhelm. I’m not someone who is looking for a devil behind every bush (or every cloud in this case, ha! ), but I do believe we do have an enemy who likes nothing better than to steal our joy. It seemed like a long while, but I think it was probably only a couple of minutes when I finally realized where this was coming from. Only I didn’t say it so Ted could hear it…I didn’t want to freak him out. After that…I enjoyed every minute. It was still overwhelming…but I was having fun! We made it to Angola, and I clicked on the runway lights before we landed. You’re going to laugh, but I think it’s so much fun to turn them on from the air. You have the power!!! If you click the mic button 3, 5, or 7 times in a row (for low, medium, and high intensity) while your radio is tuned to that airport’s frequency, it will turn on the runway lights, or brighten them. It’s pretty cool to click your mic and see a runway appear! She then handed us off to the tower controller, and he told me to tell him when I had the runway in sight. It was having trouble picking it out with all of the city lights around, so they asked if I’d like them to brighten the lights for me. OHMYGOODNESS! I suddenly saw it light up beside me…like, “Tada…here it is for you!” 😀 It was like Christmas…the centerline was all lit up and it was beautiful! We did a full stop landing. And the runway is so long (almost two miles), that I just took off again right from my landing spot instead of taxiing back to the beginning of the runway. Then I came around and did it again. Two more night landings, and two more tower landings…DONE! I could hardly believe that I got to be “one of those lights”, too! 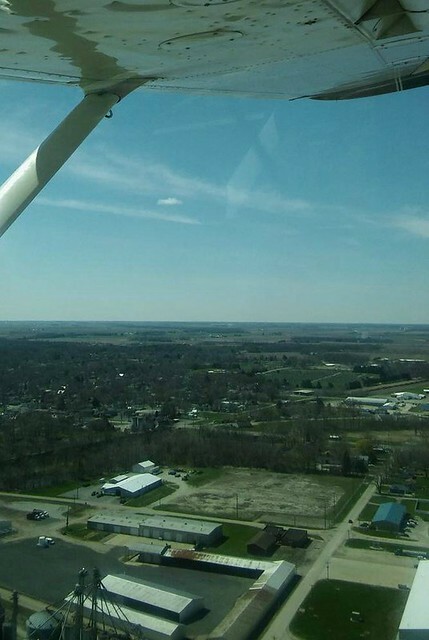 Not long after we took off out of Fort Wayne, Ted said, “Oops! You’re electricity went out!” and he shut off the GPS and the instrument lighting. Oh dear! A simulated electricity failure! He had brought along a flashlight, so I flew most of the way to Rochester with a flashlight in my left hand so that I could see the instruments. Then he had me start picking out my checkpoints again…I didn’t have a GPS to tell me exactly where I was anymore. I was thinking, “No, no! TELL me for sure which town it is!” But I knew why he wasn’t telling me if I was correct or not…he wanted me to rely on myself instead of on him to verify that I was navigating correctly. 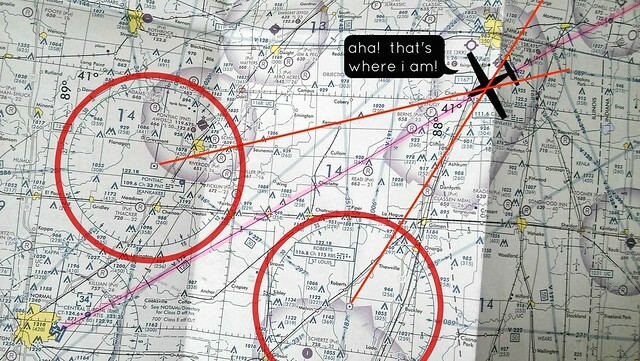 He also kept on me to stay exactly on my heading, because between holding a flashlight to look at instruments and looking down at my map, I would drift off a couple of degrees, and then correct it, drift, and correct. So I completely turned off of my heading and went towards the airport beacon. Yep….there’s the lake…there’s the airport beacon…wait a minute….I don’t know where we are…but this is not Rochester! That was not a lake…it was a field! Well…I was over WARSAW!!! Good grief! However, I was glad he let me “get lost” and that I got to practice “finding myself” 🙂 It was also a good lesson to stay true to your heading. The “Popular Rotorcraft Association” is based at MENTONE AIRPORT, in MENTONE, INDIANA. That is, what, a TWO-HOUR DRIVE from WHERE YOU LIVE…? I am going to try what you did to overcome it. A thief of joy is indeed what a certain enemy is. 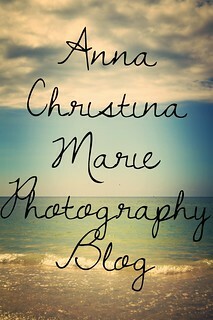 I hope you girls keep posting updates, they are always enjoyable to read! 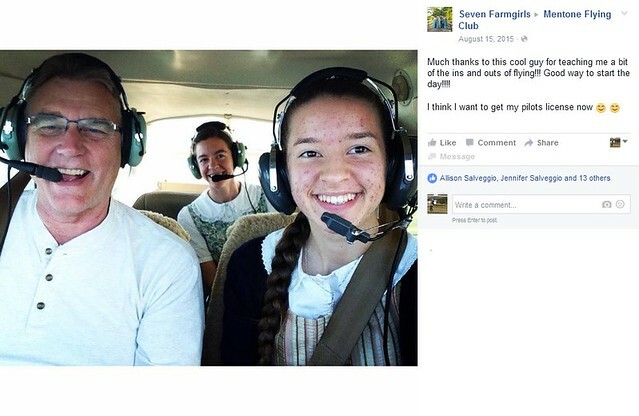 Dear Jessica, I am only 15 but i would love to fly a plane. First of all, do you know a cheaper way to do it? Also, i would want to go into commercial airlines when i finally learn. Is that a good setting for me, what do you think? I want to be in an environment where i can still have a skirt on, etc. Maybe you could help me with this. I live in Missouri. God bless you! You encourage me sooo much. Hey! I am VERY interested in flying a plane. Once I learn how to do it, I would want to go into commercial airlines. Can you have a skirt uniform, and also, can i be a Christian and do it? God bless you. If you can, i would love to know. This means soooooo much to me.